How do I use the Rich Content Editor in Quizzes.Next? The Rich Content Editor can be used to create and edit quiz instructions, question stems, stimulus content, and question feedback. 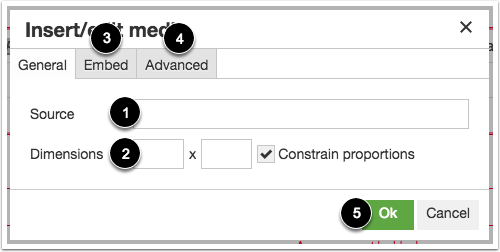 Using the Rich Content Editor, you can format text, add tables, import content and media, and insert equations using MathQuil. Note: Depending on where the Rich Content Editor is used in Quizzes.Next, all of the features in this lesson may not available. The Rich Content Editor includes several options for formatting text including undo , redo , bold , italics , underline , text color , and background color . To clear any formatting, highlight the text and click the Clear formatting icon . To align text, place the cursor in front of the text you wish to align and click the Left Alignment , Center Alignment , or Right Alignment icon . To superscript text, select the text you want to modify and click the Superscript icon . To subscript text, select the text you want to modify and click the Subscript icon . To create a list, select the text you wish to include. Then click the Bulleted List icon  to make a bulleted list or the Numbered List icon  to make a numbered list. To change the font size, click the Font Size drop-down menu . You can choose from 8, 10, 12, 14, 18, 24, or 36 sized fonts. To change the text style, click the Text Style drop-down menu . You can choose from paragraph, heading 1, heading 2, heading 3, or heading 4, heading 5, heading 6, or preformatted styles. To add a table, click the Table icon. You can create up to 10 columns and 10 rows. 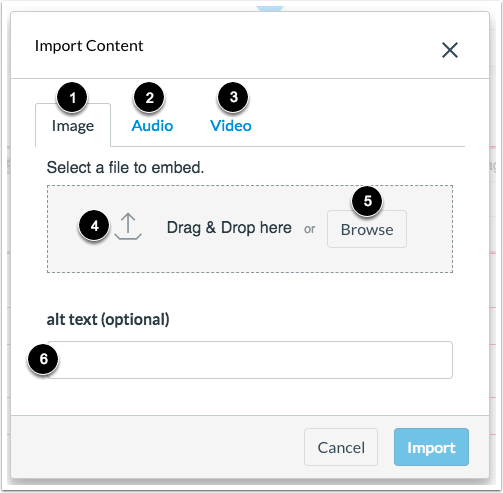 To import an image, audio, or video file, click the Upload Media icon. To import an image, click the Image tab . To upload an audio file, click the Audio tab . To upload a video file, click the Video tab . To drag and drop a file, select the file and drop it into the Drag & Drop section . To browse your device for a file, click the Browse button . For image files, you can enter alt text in the alt text field . When uploading audio files, only MP3 files are accepted. When uploading video files, only MP4 and M4V files are accepted. To insert media, click the Insert/Edit Media icon. To add media using a source URL, enter the URL in the Source field . Then adjust the dimensions using the Dimensions fields . To add media using an embed code, click the Embed tab . To manage advanced settings, click the Advanced tab . To insert media based on your selected options, click the Ok button . To insert a link, select the text to be linked and click the Link icon. Enter the link URL in the URL field . View or change the text to be linked in the Text to display field . To include a link title, enter the title in the Title field . 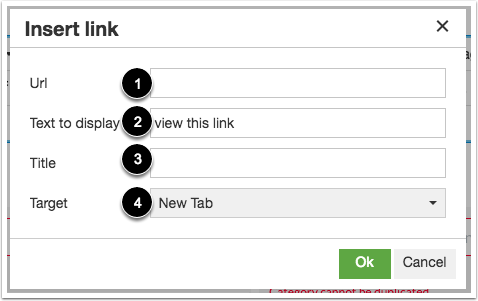 To open the link in a new tab, select the New Tab option in the Target drop-down menu . To use MathQuil to insert formula information, click the MathQuil icon. 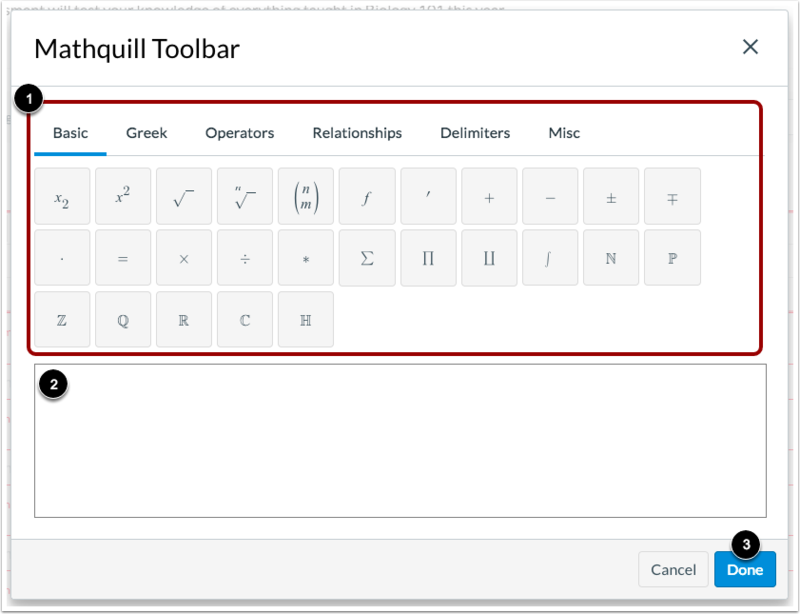 Use the Mathquill toolbar  to enter an equation in the equation field . To insert the equation in the Rich Content Editor, click the Done button . Previous Topic:How do I edit an assessment in Quizzes.Next? Next Topic:How do I edit an assessment from Quizzes.Next in the Assignments page? Table of Contents > Quizzes.Next > How do I use the Rich Content Editor in Quizzes.Next? Another issue with quizzes.next is that it is not compatible with lockdown browser; I wasted quite some time on quizzes.next before I noticed this - In general canvas team's response is that they are working on things, but a look at the time-stamps on the requested features suggests that canvas does not prioritize basic functionality. It appears that there are several feature ideas that relate to adding additional RCE functionality to Quizzes.Next questions: Quizzes.Next: Allow Rich Content editing for fill in the blank, Quizzes.Next: Rich Content Editor for Categorization Question Categories and Answers, Quizzes.Next: Rich Content Editor (RCE) for Matching Question Types and Quizzes.next - rich content editor for all question types. Adding your comments to any of these ideas is the best way for our product team to assess development priorities. Please add your vote and comments to the following feature idea: Quizzes.Next should work with Lockdown Browser or Proctorio or any similar ideas. I know this idea has come up often in the Community. But I haven't heard anything recently on the timeline for supporting Lockdown Browser. Cody, up until quizzes.next will be compatible with Lockdown, its value is negligible. Lockdown is a basic LMS feature: it should be available by default. The canvas vote-for-a-feature approach seems modern in employing social media, except meaningful response on behalf of canvas is missing. I am not surprised the lack of timeline for supporting Lockdown: I have not seen timeline for any other requested basic feature. Also some cases are labeled completed without actually being completed and reopening of a request is denied. I really appreciate your feedback and I'm sorry for the frustration you have felt with the feature idea process and Quizzes.Next priorities. Our documentation team does our best to keep our guides current, but we are only aware of short-term objectives and don't have all the answers when it comes to when and if certain features will be added. I wish I knew more; the product manager for Quizzes.Next is currently on extended leave to attend to a family emergency. I will certainly ask him more about this when he returns. Thanks! Cody, it is really not just quizzes.next. My general impression is that the canvas team does not seem to have any concern regarding the lack of basic canvas features. . . Just think of the example of legacy quiz response is not case sensitive. I honestly, don't know what canvas developers were thinking to release it without case sensitive option. There were requests regarding this canvas developer mistake, the vote is closed saying it is solved. And actually it is not: legacy still is not case sensitive; quizzes.next is case sensitive, but its use is periferial because e.g. it is not lockdown compatible, its math editor has low functionality just to name 2. When I requested to reopen the vote on the legacy case sensitive response request, I was powered down and showered with generalities. We hear you, but the answer is still the same. We know that legacy quizzes has its' shortcomings and there was a decision made to start from scratch rather than build on old code. We also know that there are elements that are not yet complete in Q.Next. You can watch Ideas and Quizzes.Next User Group for updates on progress. We will not reopen ideas for legacy quizzes because we are not developing on it. Reopening would be misleading and dishonest. Please continue to provide your feedback through feature ideas and through your local admin, who has a customer success manager that can also advocate for your institution. Please do not continue to post your feature ideas to the guides, this is not helpful. I am well aware that canvas has years-long backlog of unresolved basic issues. . . . It's an interesting approach to refer to an incomplete feature as a reason why not fix a major issue in an existing one. Why Canvas doesn't make this simple addition to the QUIZZES.NEXT for every single question type. Why Khan Academy can make it and your developers don't. I don't understand why after hundreds of hundreds of teachers are telling you how this would be helpful. Your priorities are wrong for now. If you need good developers to do this, we know plenty of them that will help with this change. I appreciate your feedback and am sorry for the frustration you have felt with the feature idea process and priorities. While I am not a product manager and cannot guarantee that any feature idea will be implemented into Canvas, I do know that our teams are very aware of feature ideas and use them to build out a portion of their priorities as they decide where limited resources are allocated each year/quarter. While there are many factors that go into deciding what does and does not get developed and added into Canvas, I can assure you that feature ideas and Community feedback play a pretty big role in their decision-making. For more information about the feature development process, see the What is the feature development process for Canvas? guide. I would suggest adding your thoughts and votes to the following ideas:Quizzes.Next: Equation Answer Option on Quizzes , Quizzes.Next: Allow Rich Content editing for fill in the blank , and Hand-written input for assignments and quizzes. You can also reach out to your institution's Canvas admin with your concerns.